There is no added risk to you undergoing vein procedures because of calcium bone deposits. How many times can you repeat vein surgery on the same leg? I had a vein stripped in April of 2012. Following the procedure, I continued to have major pain. An ultrasound found that another vein has varicosed in the same area (behind my knee). I was told that it has refluxed. How many times can you have the same leg worked on? I have experienced some effects after vein stripping surgery, is this normal? I had veins in both of my legs stripped from the groin down to the calf. The left leg is worse than the right. Three weeks after surgery, I've lost nearly 5 kg, have little to no appetite, feel nauseous when standing or walking, and still have pain in the left leg. Is this normal? After taking off compression stockings, is it normal for the leg to burn and tingle? I had a vein ligation done on the saphenous vein about 2 months ago. Since then, I've worn compression stockings every day. The problem is that when I take them off or do not wear them for a period of time, my post-op leg burns, tingles, and aches. Is this normal? Is bruising normal after varicose vein stripping? I had varicose veins stripped from my left leg 18 months ago, but a long (5 inch) bruise remains on my inner thigh. It is painful when I press it, and occasionally it causes me pain when I am walking too. Should I be concerned? How long does it take to recover from Vein Stripping procedures? I have recently had Vein Stripping Surgery and was wondering if the dark purplish area where my ulcers were will ever return to normal color? Is it normal to have leg and ankle swelling after vein stripping surgery? Thirty-seven days ago I had my left popliteal vein removed. I also had a ligation and stripping of some or part of the GSV that did not close adequately. I am still having severe swelling (1.5 inches larger at the ankle) D-dimer elevated greater than 1.0 but neg doppler. Is this normal? What should I do next? How can I get rid of or stop the visible veins on my hands? Is it normal to feel tightness 11 days after vein stripping? Can a purple-blue vein near eye safely be removed? I have a large purple-blue vein near my left eye that puffs out. I am wondering if there is any way to safely remove it without hurting my eye? What was used 40 years ago for venous surgical clips? I had a varicose vein ligated in 1971 and the surgeon left 4 metal clips behind. There are no medical records available. I have never had an MRI and need to know if an MRI study of the same area is safe. I experience pain in my legs when I wear compression stockings, can I discontinue wearing them? Will any problems occur if I do this? My left vein was ablated and my right vein was stripped. I have no varicosities, but the Doppler report says that I now have deep vein insufficiency. I'm comfortable without stockings. I have pain in my legs when I wear them. Can I discontinue stockings? Will there be any problem? I will be flying to Cuba about a month after my vein procedure, are there any precautions I should take? I'm going to Cuba to see my daughter get married. I'm set to have a vein procedure on July 13th. My flight is on August 15th. Are there any precautions I should take? Are there any complications that could prevent me from taking the flight? Do I have trapped blood in my vein, or could it be a new varicose vein? 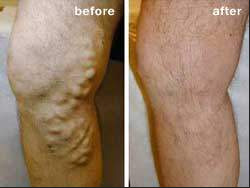 I had varicose vein stripping & litigation a month ago. Following the procedure, I developed two hard lumps in my thigh. Now, there is a very hard vein in that same thigh, and it's sore. What is this? Could it be trapped blood or a new varicose vein? I have a number of big veins on my hands, what can I do to stop them? I have a lot of big veins on my hand. They make me very shy. Is there anything I can do to stop them from getting worse?